Profeti della Quinta – Prophets of the Perfect Fifth – are a mostly Israeli group from Galilee (with one Polish violinist), now based in Basel, where they studied together at the Schola Cantorum Basiliensis. 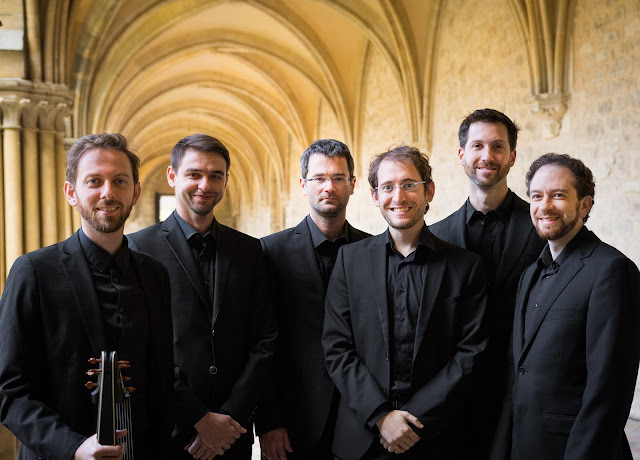 For their first London concert at St John's Smith Square on 16 May 2016 as part of the London Festival of Baroque Music, they explored the sacred and secular music of the early-Renaissance Mantuan composer Salamone Rossi ((c.1570 – c.1630). The concert was dubbed ‘Il Mantovano Hebreo’ – but with the caveat that Rossi was definitely more Mantuan than Jewish. He wrote for the Synagogue, having first made his name as a violinist and composer for the Gonzaga Court. He lived in the ghetto, but he was excused the wearing of the yellow star that was compulsory for Jews at that period. The programme for this St John’s concert mixed sacred and secular, Italian and Hebrew, with vocal and instrumental music interleaved. Rossi’s sound world is not what we would think of as Jewish; he is assumed to have studied with Monteverdi and certainly there are echoes of his fellow ‘Mantovano’ in his Italian madrigals. At a later stage in his career, and alongside his secular work, Rossi set about revolutionising the music of the synagogue, bringing together books of settings of Psalms and, famously, the ‘Hashirim Asher LiSh’lomo’ (Songs of Solomon). As a contemporary wrote: “His compositions of music in [Italian] that were printed in book form found favour with those not of Israel”. Rossi’s contribution to this Jewish musical renaissance was short-lived, though; he is assumed to have died when the Austrian imperial troops invaded the Mantua ghetto in 1730. Profeti della Quinta are enthusiastic and engaging champions of Rossi’s work. Their sound is mellifluous and light, yet grounded. Their Hebrew singing has a forward, Italianate quality and throughout the evening they exuded a warmth and charm that was irresistible. The instrumental pieces included various dances; the roller-coaster ride of a Gagliarda; the airy Corrente a 6. The Italian madrigals and Hebrew Psalms were delivered with sincerity and (for my taste) just the right amount of drama. The first half ended with a piece by the music director, Elam Rotem – pure luxury from the Song of Songs. The official programme ended with Rossi’s powerful and highly charged setting of the Kaddish, and for the encore a complete change of mood: the two tenors, as shepherds, ardently and unsuccessfully attempting to woo the coy counter-tenors, as shepherdesses. A lovely London début for the group. I wasn’t the only one in the audience who hopes they come back soon. The ensemble's disc Salomone Rossi: Il Mantovano Hebreo is available from Amazon.co.uk.